See also Derpberd Serif by zephram, Derpberd Bold by zephram, Derpberd Outlined by zephram, Derpberd HD by zephram, Derpberd Type F by zephram, Derpberd Condensed by zephram, Derpberd Turbo by zephram. Just a simple pixel font I created for use in pixel webcomics. It has a constant height which makes it good for use in speech bubbles, titlebars, and the like. I made this one to look "open" and to have lots of negative space despite its diminutive size. This family of fonts is getting pretty large, so if you make pixel webcomics (or anything else that needs tiny text in neat rows), check 'em out! This font is used by several Twitch streamers and in several games as well as in my own pixel comics. 12 Mar 2018 - v1.1 released. More Latin added. Info: Created on 4th February 2018 . Last edited on 14th April 2018. Nice 4x5 grid... Can you create an image of a layout with the '\' to the right of the ']'? As for the zero, I decided to make it look more like the 0 from Derpberd Bold for consistency. I think it looks much less like an 8 now. 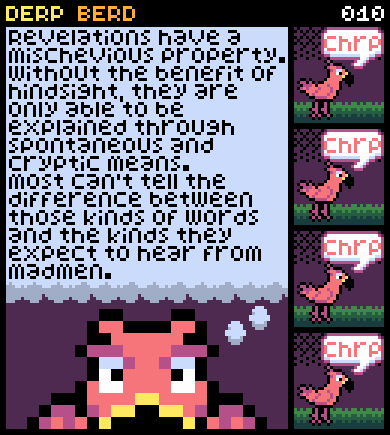 A silly comic which uses the Derpberd font (enlarged 300%).